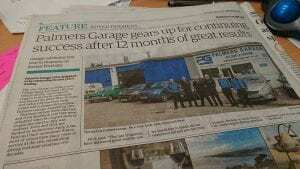 Palmers Garage Ltd is delighted to be celebrating its first year’s trading. The site, located in Withycombe Village Road, has been offering vehicle MOTs, servicing and repairs to the local community and beyond for more than 40 years and today still has deep roots connected to Exmouth’s original Palmer Garage founded in 1977.
Business owners Steve Skirrow and Nick Seabrook said they were delighted when the opportunity to reopen the site last July was realised. Steve and Nick are backed by technicians Andy, John, Paul and their accountant Simon, most of whom have many years of service at the site, establishing strong customer relations over decades. Nick said: “The last 12 months have delivered great results, and we would like to thank all our customers old and new for their support. We look to build on this by continuing to deliver excellent customer service, now and into the future”. Following on from the article in the Journal, we are also pleased to announce the launch of our new, updated website developed by another local company Vibrant Pulse. Palmers Garage are an independent workshop offering a truly personal service to the Exmouth community and further afield. With vehicle servicing, MOTs, diagnostics, tyres, exhausts and general mechanical repairs our expert team are always on hand to offer sound advice whatever your needs. Honest and trustworthy local garage with lovely, genuine (dog loving!) people. Car passed its MOT smoothly with only a minor charge for a replacement bulb. Would definitely recommend. Plus they fitted me in at short notice despite being fully booked. Thorough, honest, reliable & so helpful. fantastic garage and I would highly recommend Palmers Garage to anyone. I can honestly say that they have been incredible over the last few weeks helping me with a few problems to our family car. Honest, fair price and superb customer service are just a few of the things that come as 'standard' with this garage and its staff !! Cheers guys! I took my car here today without an appointment as I had a knocking sound appear under my car. They checked it over and reassured me it was completely safe to drive! These lovely people look out for you and not just think of all the profits! I would 100% recommend these guys to everybody and I’ll never take my car to another garage!! Good service, good communication. Van ready when promised, and had been washed! Bonus. Price was very competitive too. Would definitely recommend, especially if you own a Ford. Brilliant service even getting a new windscreen wiper (yes, in this ultra dry weather I needed one!) and will be using them again. Car back from 2nd annual service. Now Vospers has gone, took it to Palmers Garage. Glad I did. Excellent service and much cheaper than Vospers. Great to see some of the old faces again too from when I used to work at the original Palmers Garage. Would definitely recommend Palmers Garge.....nothing is to much trouble they go above and beyond to help.....Especially for a woman who knows nothing about cars!!! So thank you Palmers. Great to see Palmers Garage back! Excellent service, even washed the car too. Highly recommended, five stars all over! Contacted Palmers Garage Ltd about a steering/ride quality issue. All within an afternoon and on short notice, they were able to fit me in, quickly identify and show me exactly the problem (a worn track rod end) with a thorough explanation, and have the car fixed and safe to drive again, all for a very reasonable price. Cracking customer service, expertise and value for money! would like to highly recommend palmers garage ltd, had my mot done there today and they were so happy friendly professional and helpful i will continue to go there and will continue to recommend them. Website design and management by Vibrant Pulse.